Abstract. The vegetation optical depth (VOD) measured at microwave frequencies is related to the vegetation water content and provides information complementary to visible/infrared vegetation indices. This study is devoted to the characterization of a new VOD data set obtained from SMOS (Soil Moisture and Ocean Salinity) satellite observations at L-band (1.4GHz). 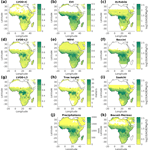 Three different SMOS L-band VOD (L-VOD) data sets (SMOS level 2, level 3 and SMOS-IC) were compared with data sets on tree height, visible/infrared indexes (NDVI, EVI), mean annual precipitation and above-ground biomass (AGB) for the African continent. For all relationships, SMOS-IC showed the lowest dispersion and highest correlation. Overall, we found a strong (R > 0.85) correlation with no clear sign of saturation between L-VOD and four AGB data sets. 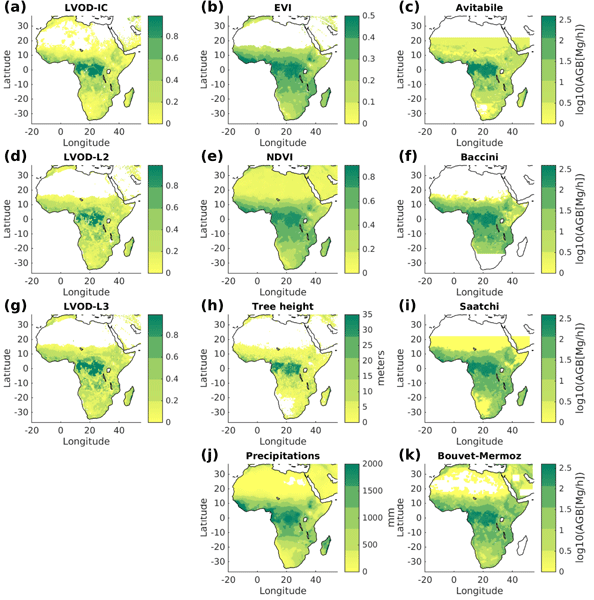 The relationships between L-VOD and the AGB data sets were linear per land cover class but with a changing slope depending on the class type, which makes it a global non-linear relationship. In contrast, the relationship linking L-VOD to tree height (R = 0.87) was close to linear. For vegetation classes other than evergreen broadleaf forest, the annual mean of L-VOD spans a range from 0 to 0.7 and it is linearly correlated with the average annual precipitation. SMOS L-VOD showed higher sensitivity to AGB compared to NDVI and K/X/C-VOD (VOD measured at 19, 10.7 and 6.9GHz). The results showed that, although the spatial resolution of L-VOD is coarse ( ∼ 40km), the high temporal frequency and sensitivity to AGB makes SMOS L-VOD a very promising indicator for large-scale monitoring of the vegetation status, in particular biomass. How to cite: Rodríguez-Fernández, N. J., Mialon, A., Mermoz, S., Bouvet, A., Richaume, P., Al Bitar, A., Al-Yaari, A., Brandt, M., Kaminski, T., Le Toan, T., Kerr, Y. H., and Wigneron, J.-P.: An evaluation of SMOS L-band vegetation optical depth (L-VOD) data sets: high sensitivity of L-VOD to above-ground biomass in Africa, Biogeosciences, 15, 4627-4645, https://doi.org/10.5194/bg-15-4627-2018, 2018.